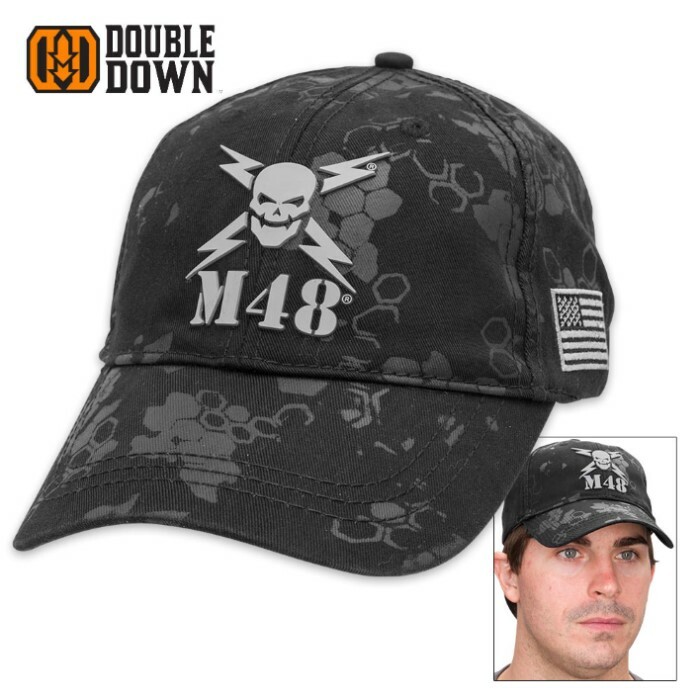 Exclusive “M48 Camo” Cotton Caps - Black, Sand, Olive Drab | BUDK.com - Knives & Swords At The Lowest Prices! 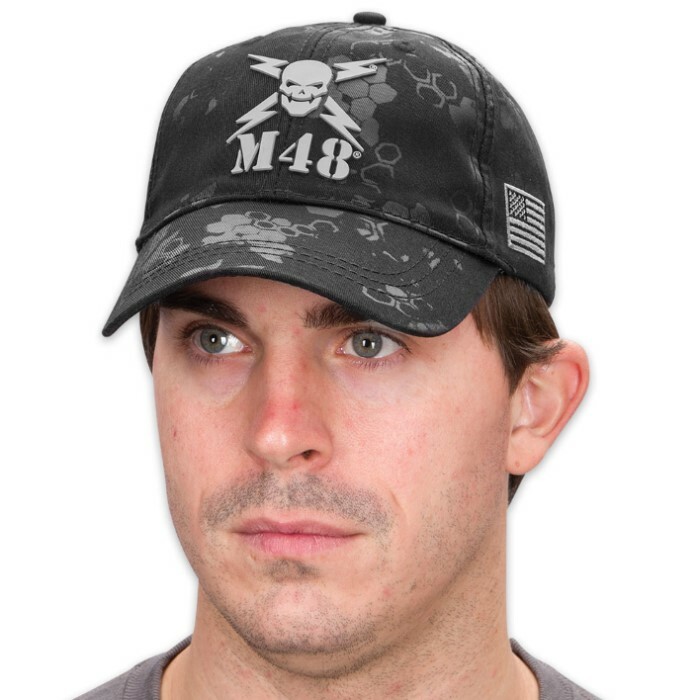 These snazzy caps from M48 combine subtlety in their monochromatic color scheme with the classic in-your-face attitude for which the brand is known. Distinctive “M48 Camo,” a cutting-edge, stylish vector/warped honeycomb design exclusive to M48, is diffused across the entire cap, adding a mod futuristic touch to these renegade-chic lids. Considering both innovative style and super-wearable comfort, these 100-percent cotton caps are equally well-suited for wear in the haunting stillness of the woods, the turbulent anarchy of urban streets, and everywhere in-between. Each cap features the roguish M48 skull-and-lightning bolts logo on the front, rendered in a shade similar to the rest of the cap - a subtle play on an in-your-face design that allows the skull-and-bolts to meld gingerly into the background. 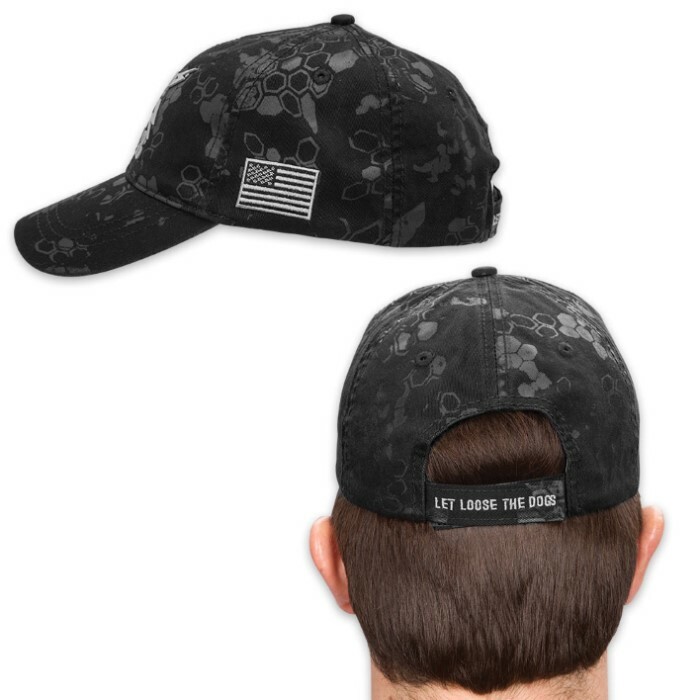 A monochromatic American flag is embroidered on the side, and “Let Loose the Dogs” is emblazoned across the adjustable Velcro back strap. Available in black, sand and olive drab; one size fits most.